More than 5 years ago, in December 2010, the Middle East began to experience a series of popular uprisings against its authoritarian rulers. This event was quickly called the Arab spring. The people demanded democracy but the results are mixed; while Tunisia is often mentioned to showcase this development, the civil war in Syria is the exact opposite and the situation is even worse than before. Next to Syria, there is another important country of the region which is experiencing the opposite of the Arab spring. Turkey, a relatively stable democracy since the end of the 1980’s, is becoming more and more authoritarian and illiberal under its current president (and former minister president, who is the head of government) Recep Tayyip Erdogan. Kemalism, the founding ideology of modern Turkey, which promotes laicism and republicanism, is in retreat. It is being replaced by the conservative-Islamic ideology of the Justice and Development Party of President Erdogan. In the last weeks, he was mentioned in many western media due to his demands of legal prosecution of Jan Böhmermann, a German comedian, who insulted Erdogan in his German TV show (Neo Magazin Royale) to demonstrate the difference between satire and revile. Another, slightly less famous, case happened a few weeks before that and was the original reason for the insult by the comedian. In this incident, a German TV show showed a satirical video of Erdogan, who reacted by summoning the German ambassador in Turkey and demanding the ban of the video. This affair was widely covered by German news, which led to a so-called Streisand effect – many viewers only discovered this video because of Erdogan’s reaction and the following news coverage; right now it has about 8,7 million views on YouTube. A few weeks ago it has been reported that Erdogan wants to sue Mathias Döpfner, the chairman of a big German media company (Axel Springer SE), because he supported Böhmermann in a public statement. But Erdogan’s fight against the freedom of opinion and of the press is not limited to satire or foreign countries – in the last 10 years, Turkey dropped down 53 places on the Press Freedom Index of Reporters without borders, and is currently (in 2016) placed 151st out of 180 countries (3 places behind Russia and 34 behind Qatar). In the last year there were raids against oppositional newspapers and members of the opposition. 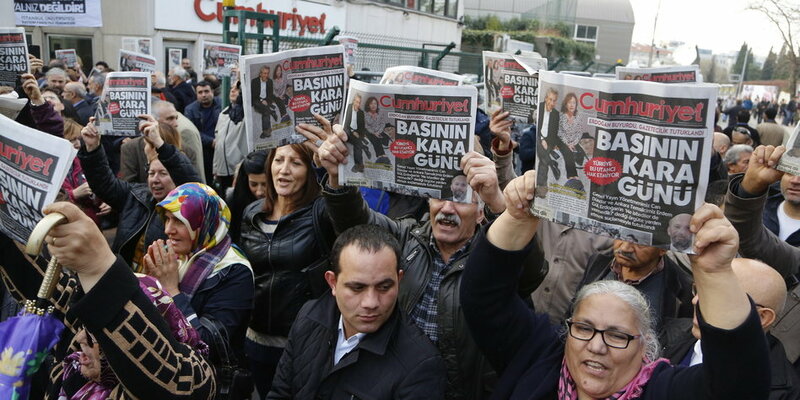 Two famous journalists were arrested and condemned to five years and 10 months in prison for a report in the government-critical newspaper Cumhuriyet about a delivery of arms from Turkey to Syria (they claimed the arms were most probably destined to radical Islamists). Erdogan personally charged them with espionage, support of a terrorist organization and attempted coup. The trial was closed to the public after foreign diplomats attended it on the first day and Erdogan claimed that other countries should not interfere in domestic issues. Regarding his foreign policies, Erdogan is re-orientating his country towards the East and deviating from the explicit pro-western course of his predecessors. The EU membership seems even further away than 10 years ago and the relations with the neighbouring countries (Russia, Syria) are difficult. The question remains whether Erdogan still wants his country to join the European Union, or whether he prefers to position Turkey as a Middle Eastern power with only bilateral agreements with the Union. Regarding his policies in the last few years, he is not very keen on joining the EU, or at least he does not try. After the downing of a Russian fighter jet by the Turkish military and sanctions on Turkey imposed by Russia, the political relations between the two countries are tense. The relation of Turkey with its southern neighbour Syria deteriorated because of Turkey’s support to the Syrian opposition and rebels. Erdogan’s goal in Syria is the defeat and withdrawal of Bashar al-Assad. To reach this objective, Erdogan supports radical Islamists and, most probably, even ISIL (at least he does not actively fight them). While supporting the Syrian rebels is crucial to Erdogan, he wants to prevent the establishment of a Kurdish state in the northern part of Syria by all means. Such an event would be a strong sign to the Turkish Kurds and the international community. For Turkey and Erdogan, retaining the Kurdish populated territories of Turkey is crucial and not debatable. Erdogan prefers a Syrian territory controlled by radical Islamists over an independent Kurdish state. To reach this goal, he is even willing to fight a civil war against the Kurds in the South Eastern part of Turkey. Erdogan wants to transform Turkey, which has a parliamentary system, into an authoritarian presidential system with himself as powerful president of a re-Islamised Turkey. This Turkey will be a regional power with stronger ties to Eastern countries (Turkic countries in central Asia) than to European countries. His goal of a religious society and State stands in total opposition to the secular Turkey since its foundation in the 1920’s. This laicism and the pro-western foreign policy were stable institutions throughout the history of the modern Turkish state. But Erdogan wants to change this country fundamentally. And for that purpose he is willing to oppress every opposing voice in his country and abroad. When there were protests across the country in 2013, he dealt with the situation by letting the police bludgeon the protesters. And he is not a great supporter of demonstrations and freedom of assembly in general. To fulfill his neo-Ottoman dream he even built an enormous palace, inspired by Seljuk architecture and representing his vision of the new Turkey. The fact that he did not have the building license for this palace is only the cherry on the top. Until now there was not much opposition from other countries. Even though he was criticized, he is still mostly seen as a democratic ally of the West (as opposed to Russian President Putin for example). That’s because he has some aces up his sleeve. Turkey has a powerful economy and, even more important, is a major and strategically crucial member of the NATO and ally of the West. Right now, he has another means to apply pressure on the West: the refugee deal with the EU, which is of huge importance to European politicians like Angela Merkel. But it seems to be changing right now; the dispute involving Erdogan and Böhmermann was widely broadcasted and condemned by the Western public. Hopefully, it is only a matter of time until Western politicians will condemn and criticize Erdogan’s policies and actions openly and take appropriate steps against him. Until then, the “madman of the Bosporus”, as nicknamed in the European parliament by the German satirist and politician Martin Sonneborn, has more or less free rein and we will see what will be his next steps to change this country and the entire region. The question remains if he is able to completely transform his country against the opposition of the Kurds, the left, the secularists and the kemalists. If he is, there will be huge problems also for Europe in the future and it has to reconsider its relationship with Turkey.